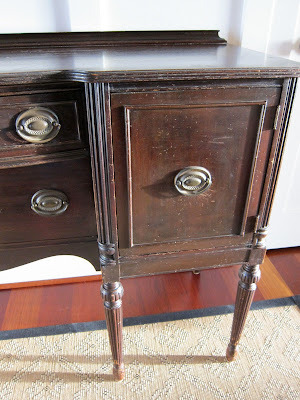 Last week I told you about a little road trip hubby and I took to pick up an antique sideboard. I may have mentioned before that hubby doesn't share my enthusiasm for old things, but he's very supportive of my many decorating ideas. I love him for that. 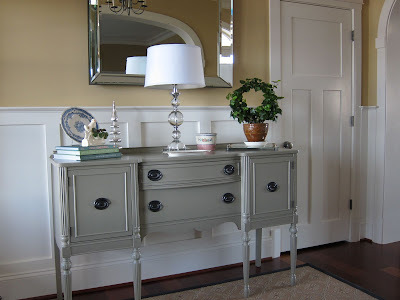 At first glance I knew this piece was just the right size for our foyer, and would be a most excellent replacement for the bench that's been calling this spot home. A face lift was in order, as this special sideboard has been loved for many years. 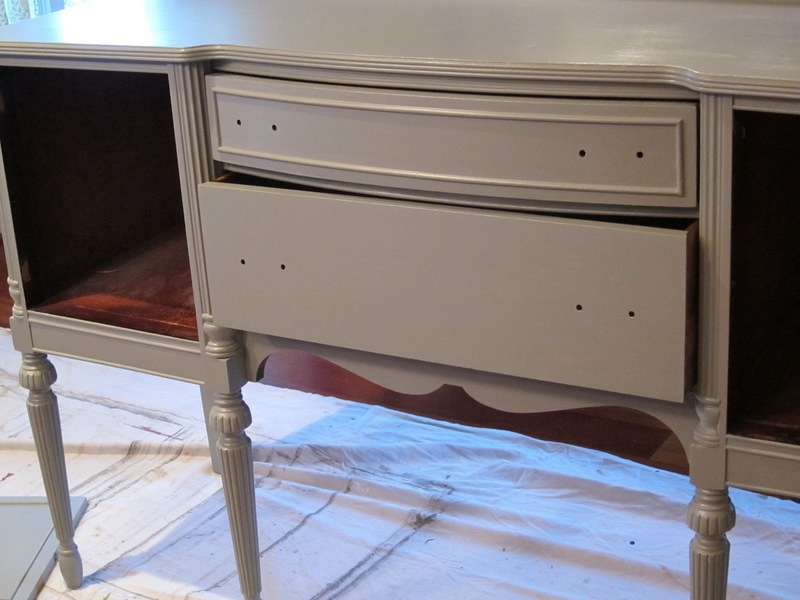 There were lots of little scratches and nicks and I was envisioning a nice fresh coat of paint. 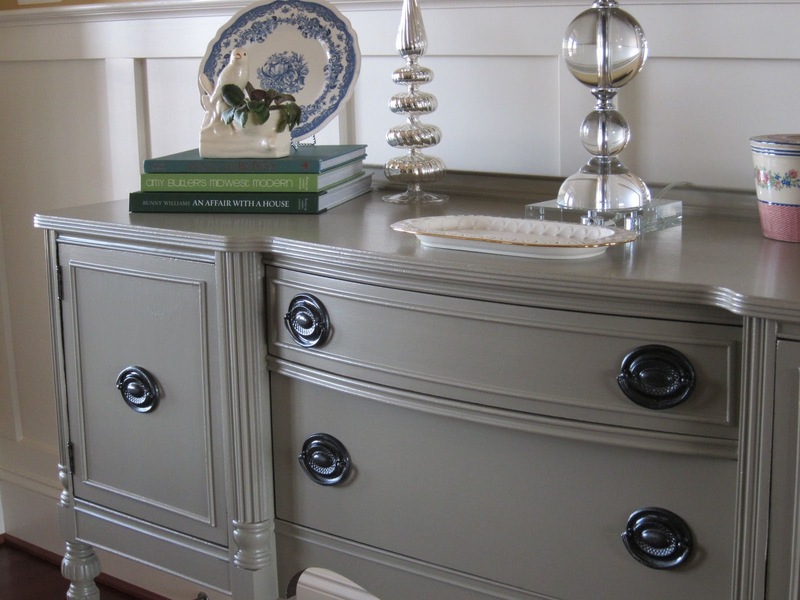 Gettysburg Grey, a neutral with a touch of green, turned out to be my color of choice. After a good cleaning and a little exploration (of the kitty kind), the dis-assembly began. I decided to reuse the drawer pulls but sprayed them with a hammered black finish. 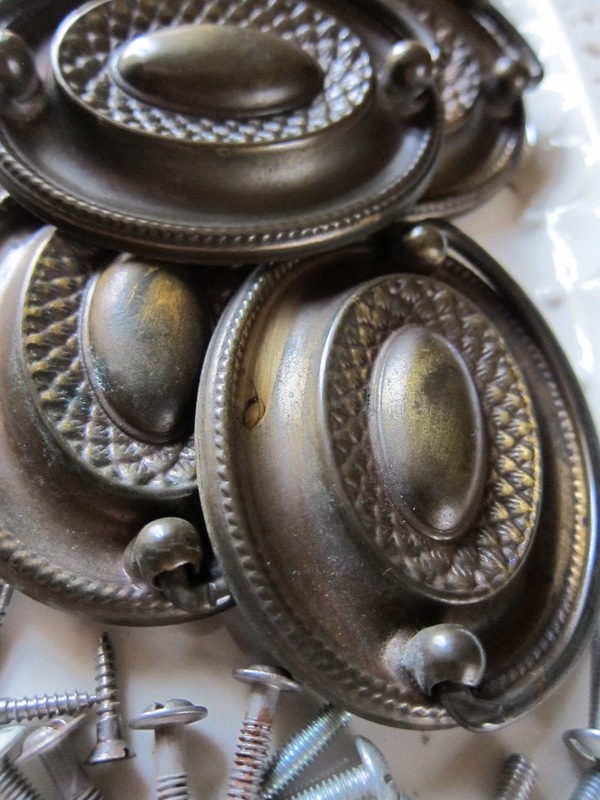 It's the same finish I used for these last September. I forgot to take a closeup "after" photo. Since the original finish was glossy in some areas, a coat of primer was necessary. 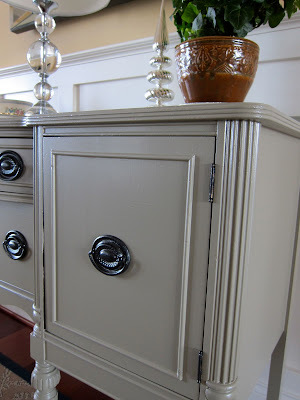 a new look for an old sideboard. I really don't enjoy painting but I adore the end result, so it's worth every single brush stroke to me. 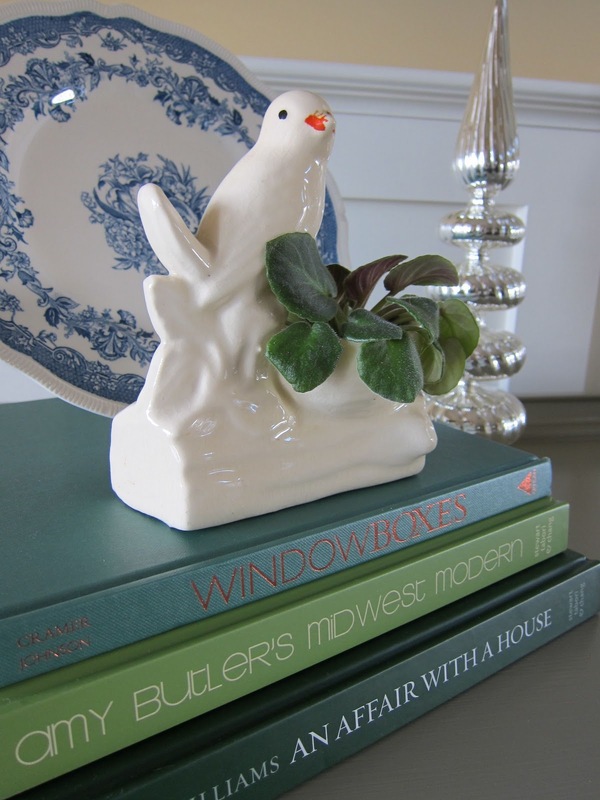 It was great fun to scour the house for accessories (that's my favorite part). I'm happy with this for now, but there will certainly be some more fiddling before I call it done. I am in love with my new sideboard and Butterscotch likes it too. I love your sideboard!! 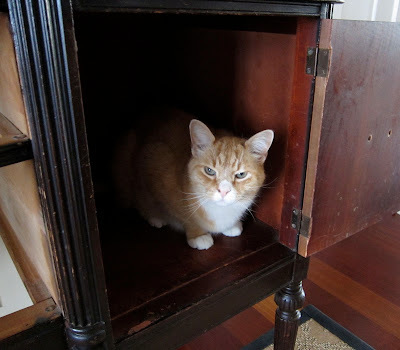 I love Butterscotch even more...lol Fourty years ago I had a cat the very same color with the same name!! Lovely foyer with the painted sideboard. 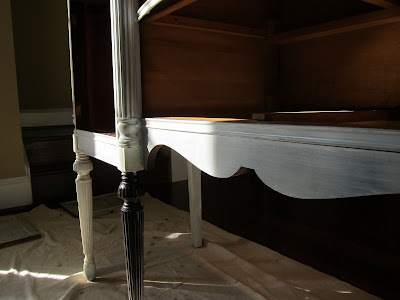 I do not have the courage to paint stained pieces, but painted recycled or repurposed furniture is a more common sight these days. I knew it would be lovely but it's taking my breath away. You always do such a beautiful job! It is beautiful. 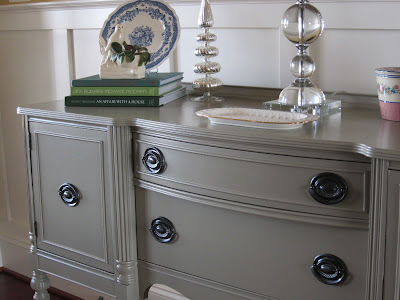 I have that same sideboard and you have given me inspiration to paint mine. 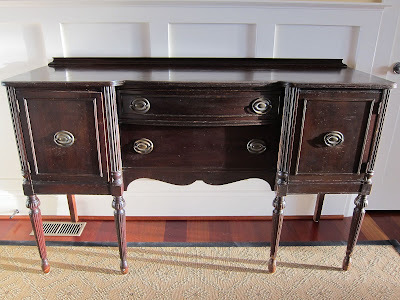 I was going through my old emails and happened upon your blog, so I decided to check to see if you had done anything with the sideboard you purchased from my brother's estate. You have taken a tired, but well loved sideboard and made it new again. My family would be delighted to see it put to such good use. You have inspired me and I have decided to refinish one of the trunks, the little foot stool and my mother's vase lamps. I hope I can make them as beautiful as you have with the sideboard and the glasses. Thank you again for sharing your inspiration. wow...this is just gorgeous. love the color. checked out your blog enough to know i want to add it to my bookmarks. looking forward to following. great project! I LOVE this! 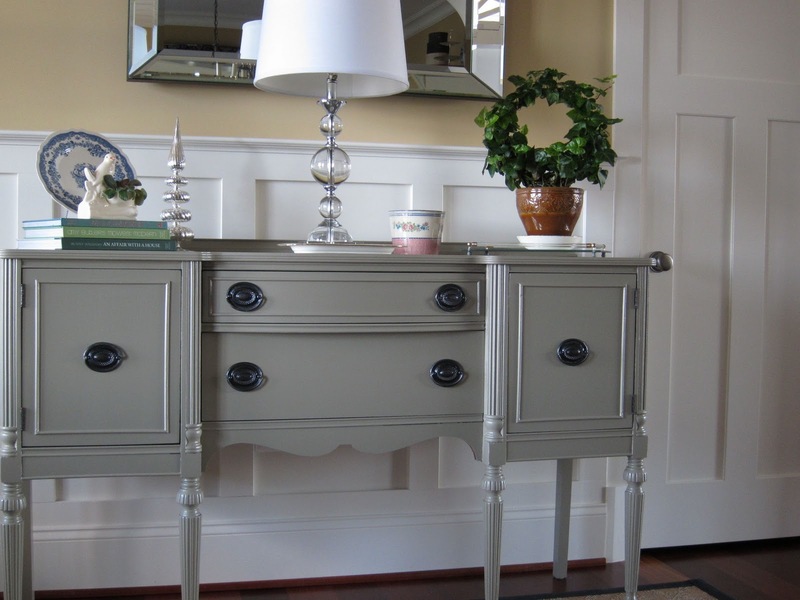 I've been on the hunt for a sideboard VERY similar to this for awhile, and this just totally sealed the deal on my intents to find one. Great job! I love it too, and guess what, I just painted my kitchen that color!! Small world! 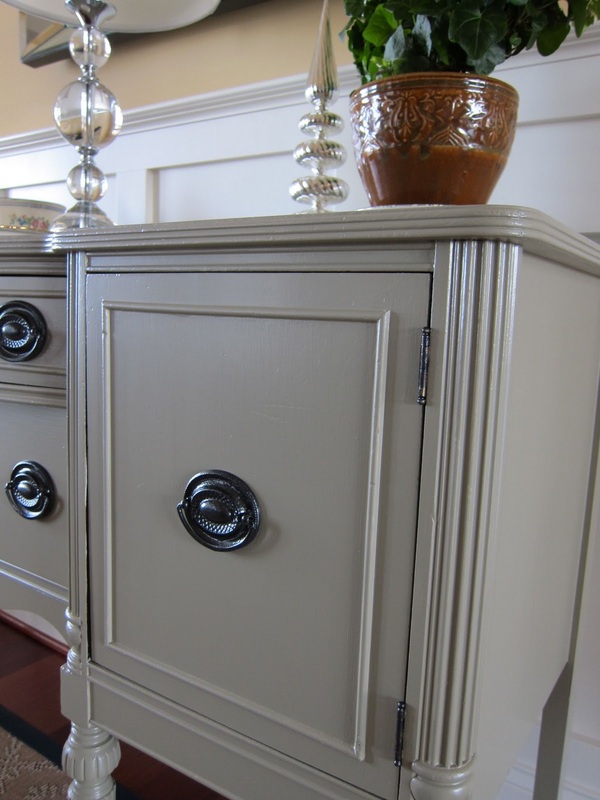 Your sideboard looks great, saw it at The Nester's Yard Sale party! Ugh that is just BEAUTIFUL! I love the color. The color looks great against the white. Great piece and so loving that color! Just found your blog and yeah so excited to now follow it! Thanks Bobbi! Yay to spiffing up with paint! I would love to find a side board like that. I wanted to thank you for joining my newbie party. I have been busy playing catch up. You rocked this project too. GORGEOUS! I love it! 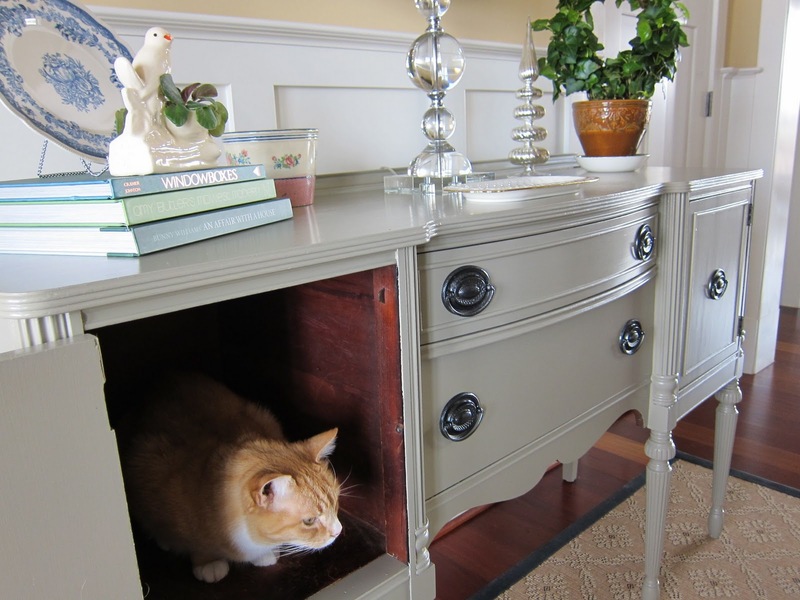 Now I can't wait to paint my hand-me-down sideboard. 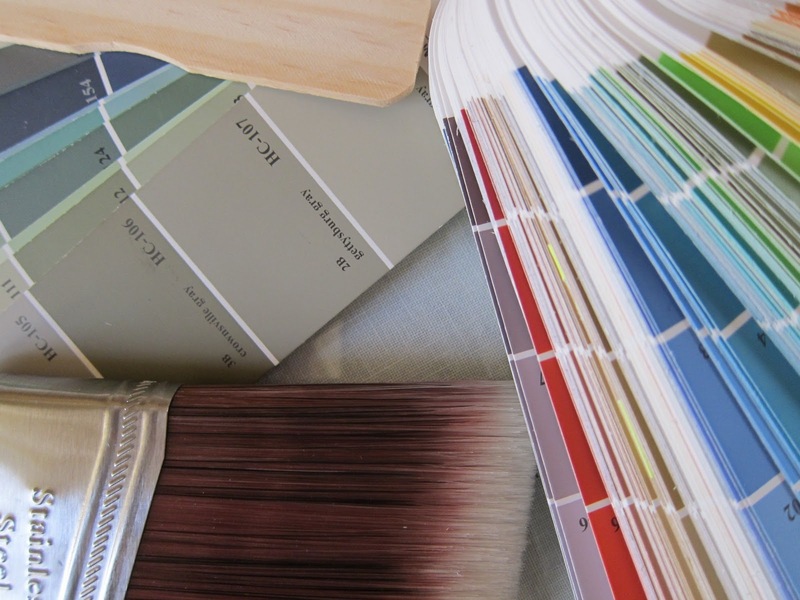 Did you use satin or semi-gloss finish?